This issue of Immunology and Allergy Clinics, guest edited by Drs. 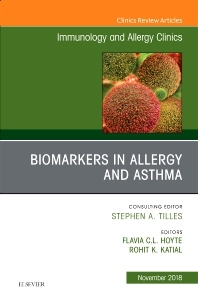 Flavia Hoyte and Rohit Katial, is devoted to Biomarkers in Allergy and Asthma. Articles in this issue include: Exhaled Nitric Oxide; Biomarkers in Exhaled Breath Condensate (EBC); Role of Eosinophils in Asthma; Bronchoprovocation Testing in Asthma; Periostin and DPP4; Role of Neutrophils in Asthma; Urinary LTE4; Biomarkers in Nasal Polyps; IgE as a Biomarker in Asthma; Genetics of Asthma; and Biomarker-directed Therapies for Asthma.